Leslie Knope is more than a TV character. She is a choice — a choice to be optimistic, hopeful, and fearless in the face of cynicism and doubt. For seven seasons, Amy Poehler was the life force behind Knope. Poehler is nominated this year for a Screen Actors Guild award for the last and final season of the series she co-produced with creators Greg Daniels and Michael Schur. Parks and Recreation (2009-2015) was never on stable footing during its time at NBC, the show always teetering on the edge of cancelation. That instability thankfully didn’t seep into the creative side of the show, which always took chances and wasn’t afraid to be true to its vision — and never more so than in the final season. The season starts with a three-year jump forward in time. This choice allows the show to completely by-pass Leslie’s pregnancy with her triplets with Ben (Adam Scott), thus preserving the show's essence as a workplace comedy and resisting the path of a wacky family comedy. The time shift also jumpstarts the lives of the other main characters, pushing them out of the Pawnee Parks Department. This sets up an entirely new set of conflicts for all of the people we follow. Andy (Chris Pratt) and April (Aubrey Plaza) are still married, and April is struggling with being a full-fledged grown-up working for Leslie. Tom (Aziz Ansari) is the successful businessman long-time viewers always hoped he could be, but he doesn't have Lucy (Natalie Morales) to share in his success. The best new conflict is the shocking reality that, after the time jump, Leslie and Ron Swanson (Nick Offerman) are not only no longer friends, but, in fact, sworn enemies. Neither will speak to the other or to anyone about the incident that caused the rift in their relationships. The mentor/mentee relationship between Ron and Leslie had always been close to the heart of the show. Ron was the yin to Leslie’s yang — his natural distrust of government and bureaucracy was the constant foil to her honest and heartfelt belief in the nobility of civil service. For that relationship to be fractured is a bold move by the Parks and Rec creative team. It is also a move that pays off in one of the best episodes of the final season and maybe of the entire series run. Season 7, Episode 4, “Leslie and Ron,” written by co-creator Michael Schur, isn’t quite a bottle episode — an episode that stands alone outside of the story arc of the season — but it is unique in its self-contained structure and demands to be re-watched for its artistry in both writing and comedy performances. The writers of an ensemble show rarely devote an entire episode to a single character or pair of characters because, narratively speaking, they run the risk of losing forward movement in the season’s arc. But there are instances where just such a choice works on both a character and story level, and that is the case here with Ron and Leslie. Since their relationship had been so central to the series from the very first episode, it would have been a mistake to allow their feud to continue or to end it hastily, without giving the resolution the time it needed to work itself out. As in “The Suitcase” (S4Ep7), the famous episode of Mad Men (2007-2015) wherein Don and Peggy spend the evening together working and drinking at Stirling Draper Price, in "Leslie and Ron" the two characters are confined in an office together. The confined space gives the two actors, Poehler and Offerman, the space and freedom to let Leslie and Ron soar. The combination of writing, performance, and direction create comic alchemy. Poehler and Offerman own the episode. If you had to put an episode of Parks and Rec into the Pawnee Time Machine (see Season 3, Episode 3) this would be it. 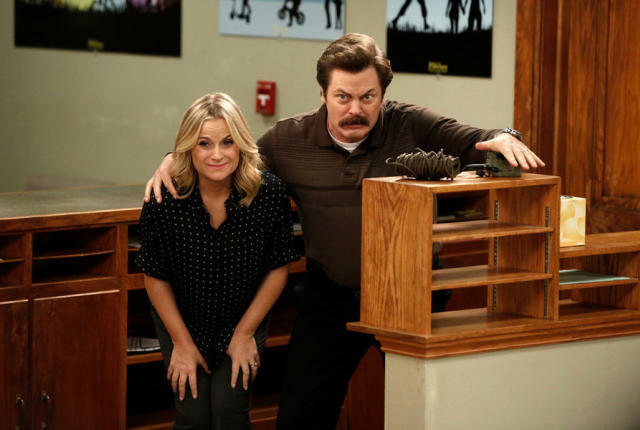 With Leslie and Ron back on the same team, the season is propelled towards its series finale with a sentimental and heartfelt momentum. Ben and Leslie might have been the shows most romantic couple, but Ron and Leslie are the real love story.